First Aid kits and telephones can be found at the fire hall and Hulbert Center of Headquarters. The Konza Prairie buildings each have unique ID numbers to make it easy for emergency responders to locate a victim. If possible, use these numbers when calling 911 from any buildings. Keep in mind that any emergency responder may not be familiar with Konza. If you are calling from a cell phone in the field, be sure to know exactly where you are and be able to give concise, correct directions to your location. Know where the nearest access for non-four-wheel-drive vehicles is. A shop with metal and wood working tools is available on Konza for use by researchers. Any personnel (including PIs) wishing to use the shop must gain permission from the Konza Prairie Project Manager, Jim Larkins (larkins@ksu.edu, 785-539-1961) and must undergo training in the safe use of tools before beginning work. To arrange training, contact Jim Larkins or Patrick O’Neal (poneal@ksu.edu, 785-539-1961). Tornado Watch: Severe weather conditions might develop. Assess your surroundings and be aware of the closest storm shelter in case it’s needed. Tornado Warning: A severe storm is imminent or a tornado has been sighted in the area. In the event that a siren has sounded in Manhattan or a tornado warning has been announced, seek shelter immediately. If time is available, seek shelter in the basement of the Hulbert Center or in buildings at the Hokanson Homestead (locks there have the same combination as access gate locks) away from windows. A buried tornado shelter has also been installed by the Cottages and "Green House". If time is not available, get down on the ground in a lower area, make the smallest target possible for lightning and cover your head with your hands. Do not seek shelter under trees, near metal rails, fences, or windows. Also, do not seek shelter in stream beds or other ravines that may flood with heavy rains. 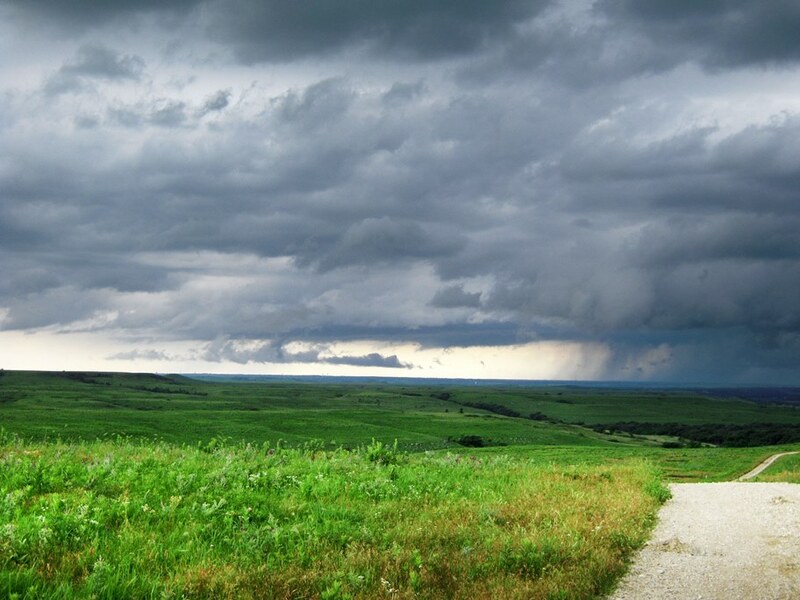 Lightning: Cloud to ground lightning is a frequent phenomenon in the open prairie and Konza Prairie gets several strikes per year to fence posts, trees, the ground, and even bison. If lightning is present nearby, move to shelter in low lying areas or inside a vehicle until the danger is past. Hail: Quarter to baseball sized hail can sometimes accompany severe weather. Seek shelter immediately if hail threatens, preferably inside a building if possible. Flash floods: King’s Creek and Shane Creek watersheds are quite large, each draining hundreds-thousands of acres and prone to flash flooding. If rains are large enough, these creeks can become raging rivers in a matter of moments. Do not enter or try to cross flood waters! Muddy and/or washed out roads: Use caution on any trials at Konza Prairie for several days after a rain. Roads and trails can wash out and seeps on hillsides can create soft areas that are not visible to the inexperienced visitor. Obey any issued warnings about trail or road conditions. Winter storms: Freezing rain and blowing snow sometimes occur on Konza Prairie, along with rapid drops in temperature and dangerous wind chills. Always be aware of potential changes in the weather and, if working in the winter, keep emergency supplies in your vehicle in case you are stuck in the cold. Roads are plowed as soon as possible after a big snow, but may still be treacherous. Temperature extremes: Summer in Kansas frequently has temperatures above 90°F. Always bring plenty of water when working in summer and wear appropriate clothing with a hat for shade. Be aware of the signs of dehydration and heat stress and retreat to air conditioned headquarters buildings to cool off if necessary. Winter temperatures can also be quite extreme. Spring and Fall temperatures can change rapidly from mild to extreme. Always be prepared for the worst case. General: ALL wild animals have the potential to be dangerous, especially if they feel threatened. NEVER approach any wild animal and immediately report any animal that appears to be acting strangely. 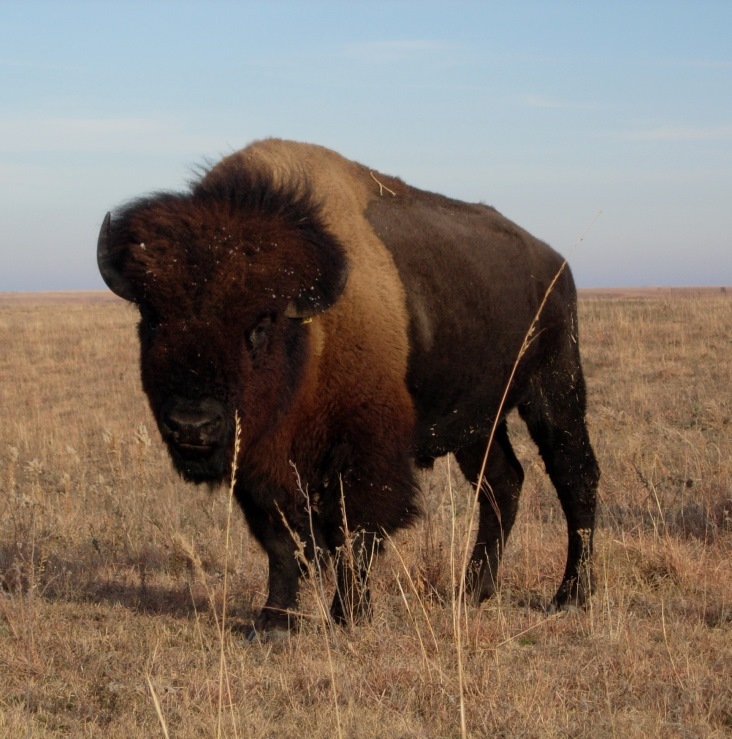 Bison: Konza Prairie has a large herd of bison in its core watersheds. While these animals are used to the presence of humans and vehicles, they are not in any way ‘tame’ and should be considered dangerous. They have been known to damage vehicles and chase researchers up trees. If you are working in the bison area, be aware at all times of where the nearest bison are and which direction they are moving. If they move toward your location, move out of the area or into shelter (trees or a vehicle) until they have passed. Never attempt to go through one of the connecting gates between Phase 1 and Phase 2 if the gates are closed and bison are congregated around them. Females with young calves are especially dangerous in spring and summer, as are bulls during the rut in late summer and fall. Predators: Most predatory mammals on Konza Prairie are shy of humans and you will likely never see them. However, species to beware of include coyotes, bobcat, badgers, and skunks. If you encounter one of these animals and it doesn’t flee, move slowly and carefully away, preferably without turning your back until safely out of the area. Report any odd behavior on the animal’s part immediately. Venomous snakes: Three species of venomous snakes can be found in Riley County, but so far only one of these is known to inhabit Konza Prairie. Neither species of rattlesnake has yet to be found on Konza as they prefer habitats not found here. However, copperheads are abundant in the wooded areas in the lower reaches of King's Creek, including the watersheds around headquarters and the nature trail. Copperheads are mild tempered and won’t bite unless harassed or stepped on. Their venom is relatively mild and rarely causes major difficulties for adult humans. However, do not take chances if you are bitten, go immediately to the hospital or call 911 for help. Venomous arachnids (spiders & scorpions): The sting of the small bark scorpions of Konza Prairie is no more dangerous than a bee sting for most people. We do, however have two species of venomous spiders. Brown recluse can be found under rocks and in many of the stone buildings. Black widows are sometimes found in and around logs of the wooded areas. Download more information on local arachnids (PDF). Bees/wasps: A number of species of bees, wasps (including the wingless velvet ant), and stinging ants can be encountered on Konza Prairie. Small sweat bees can be particularly annoying in summer months. Be aware of any sensitivity you may have to stings and take appropriate precautions. Ticks: Ticks are common from early spring to late fall, especially in areas that haven’t been recently burned. Thus far, researchers have not encountered the tick species that carries Lyme disease on Konza, but it has been reported in nearby areas. Other tick-borne diseases such as Ehrlichiosis, have been found in ticks on Konza. See information on symptoms of tick-borne illnesses. Dress appropriately to reduce the number of possible ticks and use insect repellent sprays when appropriate. Information on ticks in Kansas can be downloaded from the K-State Research & Extension website. Chiggers: Larval chiggers are very common on Konza, especially in unburned areas. While chiggers in the US aren’t known to carry diseases, chiggers do cause an immune response in most people, some more than others, and numerous bites can be very uncomfortable. Dress appropriately to reduce the number of possible chiggers and use insect repellent sprays when appropriate. Information on chiggers in Kansas can be downloaded from the K-State Research & Extension website. Mosquitoes: Mosquitoes can also become irritating pests in summer, especially in wet years. Again, dress appropriately and use insect repellent sprays. For information on mosquito-borne diseases, see the Centers for Disease Control and Prevention website. Information on mosquitoes in Kansas can be downloaded from the K-State Research & Extension website. Konza Prairie’s terrain consists of relatively flat topped hills with steep-sided ravines cutting throughthe landscape. Because of the thick grasses, rocky outcrops can be hidden and make footing on hillsides treacherous. Wear appropriate hiking boots with ankle support when walking through areas where you can’t see the ground and beware of hidden rocks or small woody shrubs that can trip you up. Also, badger holes and pocket gopher mounds can make footing uncertain. Always pay attention to where you are walking. The tallgrass ecosystem evolved in the presence of wildfires. So, wildfires are almost always a possibility. They can be caused by lightning strikes or by careless drivers on bordering roads. Catalytic converters on research vehicles can also cause fires if parked in tall grass. Always park your vehicle in the short grass of mowed fireguards where possible, especially in fall, winter and early spring when grasses are dry. Pay attention to any posted warnings. Report any smoke or fire sightings immediately (539-1961 or 911). Be aware that controlled burns are conducted (mostly in spring) and can occur on any day March – May when weather is appropriate. If you are working on Konza during those times, be sure to check in before going into the field to see if and where a burn may occur. DO NOT approach areas being burned, you may not properly predict where the fire will go and could become trapped. Fire crews have all their attention on what they are doing and have no time to watch for people who aren’t supposed to be there. Again, obey all posted warnings. For general laboratory safety practices see Environmental Health and Safety.